VENTURA -- For those who haven’t had the opportunity to see Nikko Slife in action on the football field, fear not. He’s still young, a sophomore at Buena High, seemingly with a bright future ahead. There’s plenty of time to check out one of his games. Understand this beforehand though, Slife tends to leave most spectators in awe after they catch a glimpse of him on the gridiron. The 15-year old has been known to do more with one arm than most his peers are capable of accomplishing with two. To clarify, Slife was born with a portion of his left arm missing just below the elbow. With the aid of a prosthesis and a pair of weight-lifting attachments, he was able to build some much-needed strength this season and emerge as a consistent contributor on number of different levels for the Bulldogs. Nikko Slife hopes to be a contributor to next season's Buena varsity team. “We don’t look at Nikko like he’s someone with a disability, he is a football player in our eyes,’’ Buena coach Cliff Farrar said. “The neat thing about him is, he’s been able to overcome an adversity that some of us wouldn’t be willing to try and move on from. Over the past couple months, Slife’s talents were put to good use by the Bulldogs' coaching staff. For one, he was a standout on the junior varsity team. And from time to time, when an extra body was needed to help run the scout team, Slife’s number was called. Sacrificing his time, and body, for the betterment of the program was never a problem. In fact, had Buena played a bit better during the regular season and qualified for the Southern Section Western Division playoffs, beginning this week, there was a good possibility Slife would have been rewarded for his efforts and made his varsity debut. Ventura Buena sophomore Nikko Slife was born without part of his left arm but hasn't let that stop him from being a football player. 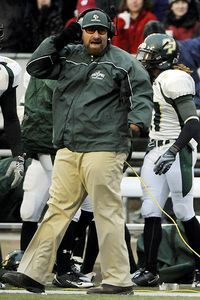 “I don’t feel different from any other high school football player, I do the same things as everyone else,’’ Slife said. “Before games, I have a routine. First, I listen to my iPod, somewhere by myself. Then, before the kickoff, I talk to the coaching staff about what my assignment is. After that, I go out there to do my job. Little, or nothing stopped Slife from developing into a special teams specialist on junior varsity. He was a gunner on kickoffs and punts, typically the first player downfield to make contact with the opponent. Slife was also the kicker and converted 26 point-after attempts for a team that finished with an 8-2 record. Buena JV coach Mike Olgy helps Nikko Slife adjust an attachment on his arm as Nikko's mother, Martha, looks on. When given the chance to play on the defensive side of the ball, he made the most of the opportunity from his cornerback position. 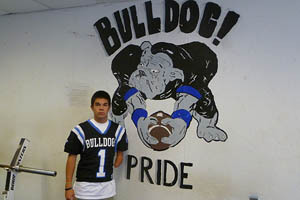 Slife ended up with eight solo tackles for the Bulldogs and was involved in countless other assisted stops. “Nikko is an amazing kid, a truly amazing kid,’’ said Mike Olgy, the Buena junior varsity football coach. “When he first came out for the team, I didn’t know how we were going to get him into some of our games. I thought we’d have to be winning by a lot of points or be way behind on the scoreboard to get him some playing time. That was never been the case, not at all. Nikko earned his job on this team. “There were times this season when opponents saw him and went right after him. Give Nikko credit, he held his own each time. He didn’t back down from the challenge. He got in there, with one arm, put his head down and made plays all over the field. Nikko is a fighter. To understand how far Slife has come, perhaps it’s best to take some time and briefly reflect on his past. He’s no stranger to football and has been playing the game for as long a he can remember, years and years now, dating to his days in Pop Warner. Recently, however, things began to change. Once Slife hit his teens, he had a growth spurt. A muscular imbalance became a problem because his right side was far more developed than his left. As a result, scoliosis, a curving of the spine from side to side, loomed as a potential threat to his well being. Accordingly, the Slife family searched for an answer. Turns out, Payam Saadat and Maxgrip Systems were the solution. Saadat, a Los Angeles native, played football at St. Monica’s High in Santa Monica before moving on to play linebacker at Washington State in the early 1990s. Saadat is an amputee, having lost his left arm just below the left elbow in 1993. Currently, he’s the co-defensive coordinator for the Army football team after coaching at Cal Poly San Luis Obispo as well. Perhaps equally important is the fact that Saadat worked with Maxgrip Systems to create the barbell and dumbbell attachments Slife uses on a regular basis these days. Payam Saadat, an amputee and former college football player and now a coach, has been instrumental in helping Nikko Slife pursue the sport. Saadat, along with the Ventura Police Activities League and numerous other individuals within the community, helped raise money so Slife could afford to be fitted with the equipment. 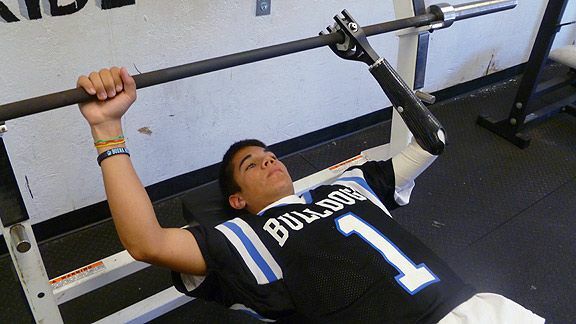 Nearly a year later, he is as strong as ever, constantly in the Bulldogs' weight room lifting with his teammates. On the field, that has translated into added confidence and added responsibility for Slife. When it comes to life off the field, he's as healthy as ever. “The Slife family reached out to me, and it just so happened that I was in California at the time on a recruiting trip," Saadat said. "Once I met Nikko, I knew what needed to be done. Sometimes in life, things are aligned in the stars, this whole situation is one of those times, there's no other way to explain it. Slife is indeed an inspiration. Those looking for further proof, go ahead and attend a football game at Buena around this time next season. Chances are, Slife will be in uniform for the Bulldogs, most likely on varsity, making an impact similar to the way he has done so may times in the not-so- distant past.